Advice for anglers headed to Homer and beyond into the Deep Blue. A guy can see a long way when he’s in the third grade. At least that’s how our skipper remembered it. Mike Manns grew up on a farm in Indiana and he remembers telling the school librarian he was going to be a captain in Alaska. The kid had perspective. Today he makes his home in a town called Kasilof on the Kenai Peninsula and runs his fishing boat, the Arctic Addiction out of Homer. Before dawn the water in the harbor shone like a mirror and the masts bent in the midnight blue ripples. Out beyond the jetty the surface of the ocean was riffled like a trout lake. For Travis Huisman and his 13-year-old son Tanner this was a first trip to Alaska. For brothers Lyn and Bill Hocker, from Redmond, Ore., this was a chance to get their first halibut. My friend Bob Mulligan and I hoped for our next ones. The catching is harder in September when the halibut head out toward the open ocean. And it’s harder now that the state of Alaska has a two-fish limit where at least one fish must be under 29 inches. A lot of skippers were running as far as fifty miles out, but Manns had a secret spot. We rigged big circle hooks and baited with chunks of herring. Lyn was the first to drop his bait to the bottom and when his 3-pound weight touched down, a halibut climbed on. Lyn cranked his first halibut to the surface and Manns “welcomed it to the club." In 49 minutes we had our limits on the boat, the biggest weighed about 50 pounds. When we were underway again, the radio crackled as a skipper on another boat “fished” for halibut information. Manns obfuscated. The other captain should have known better. “I think traveling gives you perspective,” Manns said. “You get way out to a place like this and you look back to where you’re from and think about it. You get bigger ideas.” And bigger fish. As soon as the captain shuts off that motor, take a look at the depth finder. See those little blips betwixt the bottom and the top? Those little ones that look like fish. Those are fish, unless they are something else. Anyway, we like to think they are fish. If they are halibut, they are going to be close to the bottom. If they are salmon, or rockfish of some sort, they are going to be anywhere from close to the bottom to right below the surface. Don't waste time in water that doesn't have a fish in it. Job one is to put the bait down in a pod of fish. If they are 30 feet below the surface, pull 30 feet of line off the reel and add whatever amount is necessary to compensate for the distance of the rod tip to the water and the angle of line into the water. If you took Geometry in middle school, you can make an educated guess. If you skipped that class, well, do the best you can. Some places on the boat are better than others. And the best spots - whether they are on the port side or starboard, in the bow or in the stern - depend on the wind, the waves and the style of fishing. I like to stand where the line is not under the boat, where I can see it and have more control over the presentation of the bait or the lure. If there is a bet running on the guy with the first fish in the boat, though, it can make sense to be the one with the bait under the boat. The captain usually positions the craft to drift over a school of fish, so the baits on the leading edge are likely to get bit first. When dead-drifting, work your way to the back of the boat, to one corner or the other for good mobility when a fish is hooked. 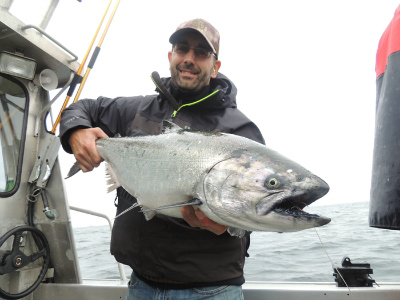 When trolling for silvers, remember coho are often attracted to the wash of the propeller. This is a good time to fish from the bow with a bait in that oxygenated water beneath, between or behind the motors. Some of the best fish of the day are hooked close to the boat. When the lines are short, it is easy to lose a fish hooked in this manner. Salmon in the salt are soft of mouth and full of fight, in the prime of their life, charged on the protein they've packed on throughout the summer. Once they've taken the bait, let them chew it, then raise the rod and let them bend it. It is a good idea to bring latex gloves to keep your human scent off the bait. When going after halibut, a bigger bait is more likely to catch the attention of a bigger fish. For the biggest halibut, the biggest split-tail jig, or the biggest herring in the bait box is the best bet. And don't wait around, the first bait to the bottom is the one most likely to get bit. And if the fish is a big one, no one else fishes until it is in the box. In much of Alaska, there are slot limits on halibut and other bottom fish. If the goal is to catch at least one under 30 inches to fill out a limit, bigger baits aren't necessarily better. Use a smaller jig and get it on the bottom fast. When targeting feeder kings and the captain says drop the baits down to 80 feet, do like he says. Chances are, there is a school of fish that fills the water column between 70 and 90 feet. Eighty feet gets your bait where it will do the most good, but sometimes a bigger fish is roaming around the edge of the school, often on the bottom. Go a bit deeper for a chance at a bigger salmon. On a charter boat, there might be a number of attractant scents in a bucket near the bait box. If the bite is slow, don't be afraid to freshen a bait with a squirt of anise, shrimp oil or herring scent. In fact, it's a good idea to bring your own favorite attractant. Sometimes a little bit of scent makes a big difference. Halibut, ling cod, cabazon and salmon are predators used to chasing their food. That's why jigging works. Lift the rod tip, drop it back down and repeat. When fishing for halibut, bounce the bait on the bottom, lift up and let it touch down again. Imagine each undulation in the structure. Reel up when the bottom rises and let line out when it drops again. Keep the bait moving, even when the deckhand isn't watching. In a school of salmon, when the bite is on, there may be a depth where the fish are most active. If your last bite was at 30 feet, get the bait back down to 30 feet. And then drop it down and reel it back up. Fish expect to chase their food. Keep watching the graph and keep the bait down where the fish want to eat it. If someone else has the hot rod, look to see how they're fishing and ask questions. The easiest place to lose a fish is when it's alongside the boat and the guy with the net blows it. Don't be that guy. Get in front of the fish. Put the net where the fish is going instead of where it's been. Don't chase a fish with the net. Instead let it swim in headfirst. It's a team effort. The angler with the rod should reel down within a few inches of the swivel and get the fish's head up. When the fish's head is angled toward the surface, it can be planed right into the net. Sometimes it takes a couple of tries, but an angler who can get the fish's head up has a good shot of landing it. The net should be held out of the water until the fish is ready to go in headfirst. Read its body language. Is it ready to give up? Is it going to make another run? A little dialogue between angler and net-man pays off. When the fish is inside the net, the net-man can swivel the handle up and trap the fish inside it for a moment. This is the time to decide whether the fish will be kept or not. If it's headed for home and freezer, swing it aboard and welcome it to the club. Folks that have never been to the ocean ask a lot of questions, Mike Manns said. One common thing people new to the sea want to know is “What is the altitude here?” This is a hard one to answer with a straight face. Here's an easy formula: measure the distance from the top of your head all the way down to the water level then subtract your height. That should get you close. Once they get out of harbor, Manns said, a common query is, “How far do you have to go to get to the ocean?” Well, it’s all saltwater, he says, and it’s all hooked together. An engineer from Ohio asked about the anchor. Fifty feet of chain, 600 feet of line. “When you put the anchor down, does it go all the way to the bottom?” Yes, gravity works under water too. Another angler wondered about salmon. “The kings run in June, the sockeyes run in July and the pinks run in August. When do the smoked salmon run?” As soon as they see the cream cheese and crackers. The islands fascinate people from the Midwest. One asked, “Are there any roads that lead to that island?” Another puzzled, “Does the water go all the way around the island?” Yet another inquired if the islands float around in the ocean. With all the perspective that the boat gives a new angler on open water, one person asked if they could see Mount Everest on a clear day. Maybe. If it weren’t for the curvature of the earth. That whole round earth thing gets in the way. We motored over a place the skippers call Silver Ridge and Manns dodged more questions from other boats about where the halibut were. “If I tell one guy, he’ll tell another and these fish will go away,” he said. Manns rigged our baits while the deckhand, Richie, lowered the downriggers. According to the depth finder the fish were 80 to 100 feet down in 143 feet of water. Richie dropped one line to 100 feet and the other at 95 feet then Manns set a zigzag course. In a few minutes we had our first grab and our first swing and a miss. Ocean salmon are soft-mouthed and it’s easy to pull the hook out of their mouths. First to the boat was a six-pound “feeder” king for Bob Mulligan. Feeders are the fish that are still out there after the mature salmon migrate. These will spend another year or more, getting bigger before they head upriver to spawn. Tanner boated a three-pounder and our biggest to the net was 20 pounds. At the end of the day we lined up our fish on the cutting table at the Kenai River Red Lodge back in Soldotna. My two halibut, 29 inches and 30 inches were the smallest of the bunch, but my camera angles made them look bigger and meaner. It's all about perspective.